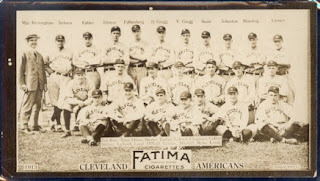 DeansCards.com has been lucky enough to see a few 1913 Fatima Teams T200 cards in the past couple of years. These rare baseball cards are similar to some of the earliest baseball cards ever printed because they show a photo of the entire team instead of individual players. The entire set consists of only 16 cards. There are 8 National League and 8 American League teams represented. Each card measures 2⅝” by 5-13/16”. The players’ names are listed at the bottom of the photo, above the Fatima logo on the front. The Fatima T200 set is also known to have been printed as premiums. 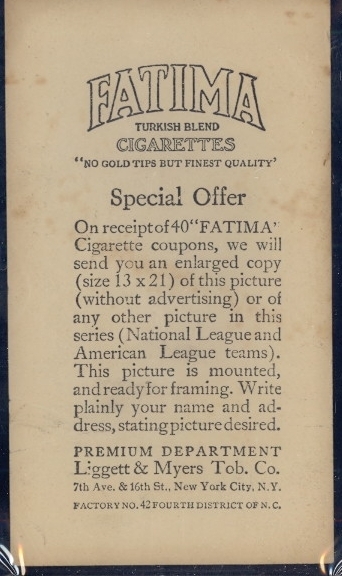 The American Tobacco Company, which owned the Fatima brand at the time, had used the idea of premiums in the past with the Turkey Red cards. The Fatima premiums, however, are exceedingly rare and very expensive. The premiums measure a much larger 13” by 21” and were printed on glossy paper. The Fatima premiums could be obtained by sending in 40 Fatima cigarette coupons, which would have required a lot of smoking, considering that the Fatima packages held 100 cigarettes each. 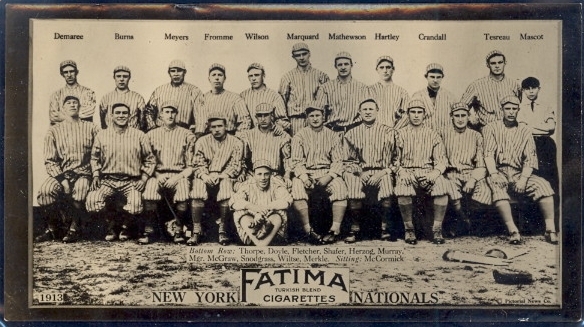 The regular Fatima baseball cards were inserted into the Fatima cigarette tins. The Fatima brand name originally belonged to the Liggett & Myers Tobacco Company, which was purchased by the American Tobacco Company in 1897. When the American Tobacco Company’s monopoly was dissolved in 1911, the Liggett & Myers Tobacco Company reappeared and began manufacturing Fatima cigarettes again. Liggett & Myers is still one of the largest American tobacco companies today. The backs of the Fatima cards make them very easy to identify. They have the Fatima logo and the phrase “No gold tips but finest quality” at the top and then an explanation of how to obtain the Fatima premiums. Some of the more popular T200 cards include the Philadelphia A’s card, which features Hall-of-Famers Chief Bender, Eddie Collins, Connie Mack, Eddie Plank, and Home Run Baker. The Cleveland Naps card is also highly valuable because it includes Shoeless Joe Jackson. The New York Giants photo also features Jim Thorpe. The T200 Fatima cards are some of the most interesting and historically valuable cards ever made. Here at DeansCards.com, we are always interested in buying T200 cards. If you are selling T200 cards or any other Pre-War cards, please click here. To view our T200 Fatima reprints, please click here.